We've just arrived back in Placencia, Belize after a summer up in wilds of Vancouver, British Columbia. It's so wonderful to be back! Before I quickly become acclimatized to life in the tropics, I want to share my thoughts and feelings from the first 24 hours on the ground. We arrived to a very welcome site at the small Placencia airport where our friend and landscape architect Gilles from Manaka Design, had brought our truck to greet us. 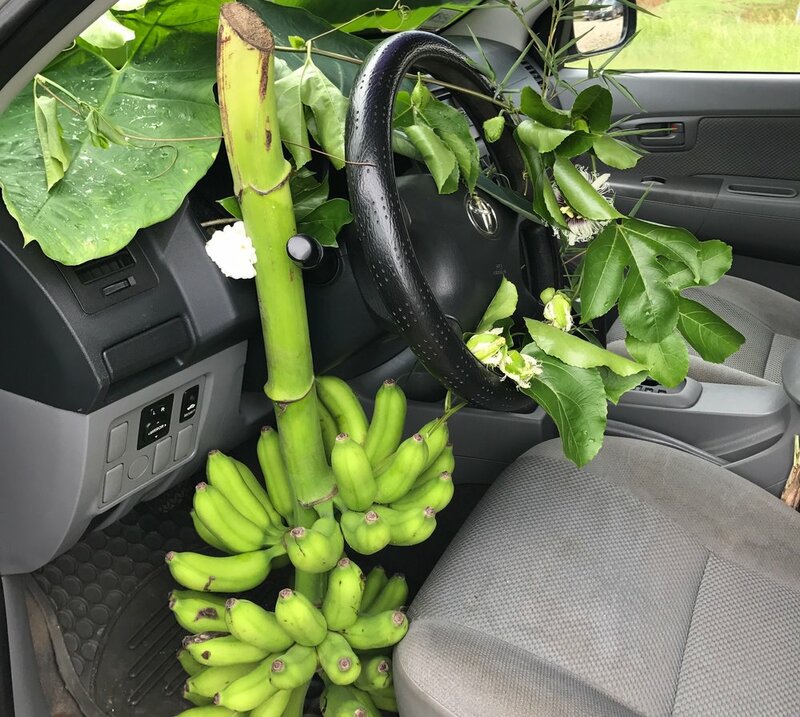 Not only was it full of greenery from our development Amik Kil Ha', there was a bunch of bananas from the land waiting for us! On the practical side, because we are staying very close to the Caribbean Sea with its' salt air, the metal fixtures in the house have furthered their march to destruction with rust and many things have a slight coat of mould after 6 months of inattention. All easy to fix and clean and the place is feeling like home already! Gone are our fall clothes and warm comforter, replaced by shorts and flip-flops! But... the strongest impression made upon arrival is the friendliness of the wonderful Belizean people. Greeting us, welcoming us back, smiling and waving and nodding. There is a welcoming energy here, both from the other gringos and the locals, where they welcome people to share in their good fortune. The torrential November tropical rains have started, the humidity is surprising and the feeling of coming home is all around.